Someone named this small tree ‘Water Jasmine’ (Wrightia religiosa Benth.ex Kurz). I guess because its flower is white and fragrant though it is not a shrub. 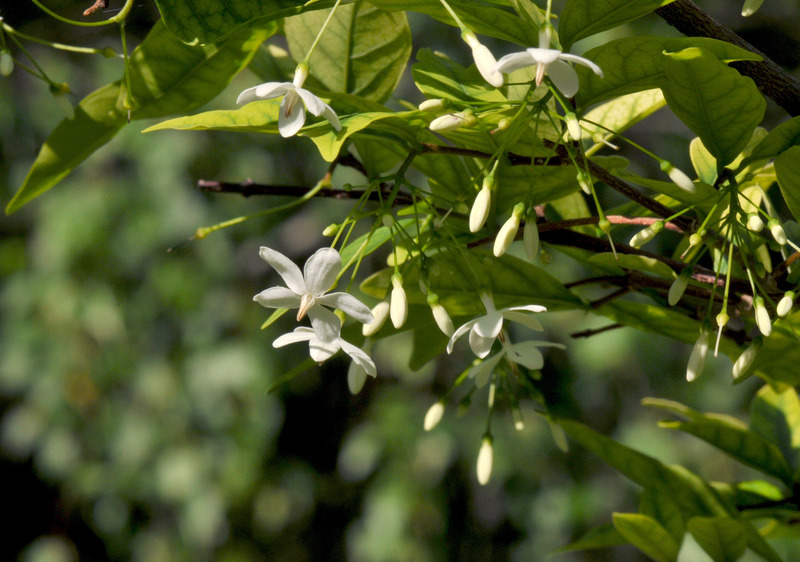 This Water Jasmine can grow 10 to 15 feet high and frequently grows right next to fresh water. I have grown this plant from seed and it’s been with me for 15 years but I couldn’t let it grow that high. Since it’s a tropical in origin, it won’t survive the winter here in the Northeast U.S. so it spends the winter in the basement with other tropical plants. It would drop almost all its leaves twice a year: when I bring it down to the basement and when I bring it back outside in spring. I think it resents the drastic change in temperature with each trip. 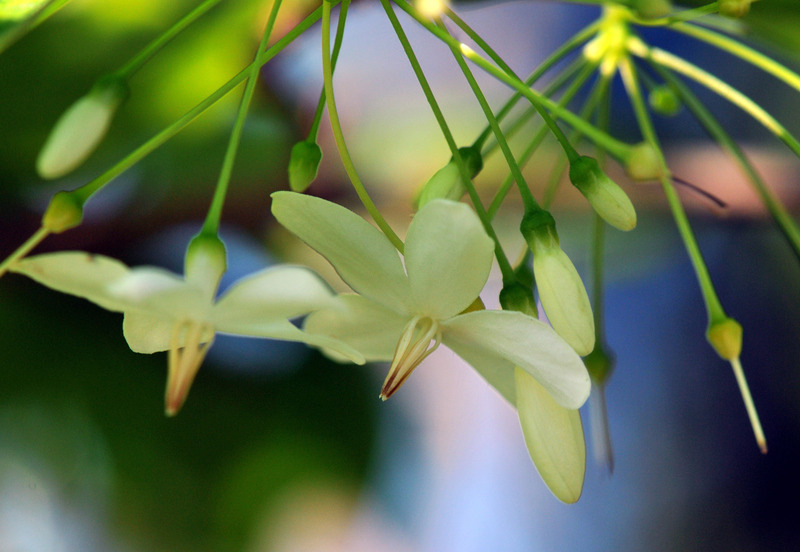 The little star shaped white flowers bloom in a cluster on the underside of the branch. It has a lightly sweet fragrance that grows stronger in the evening and the bumblebees love it. It blooms year round in the tropics but profusely when the temperature is cooler. Mine wont bloom in the basement but blooms profusely in summer when outside. 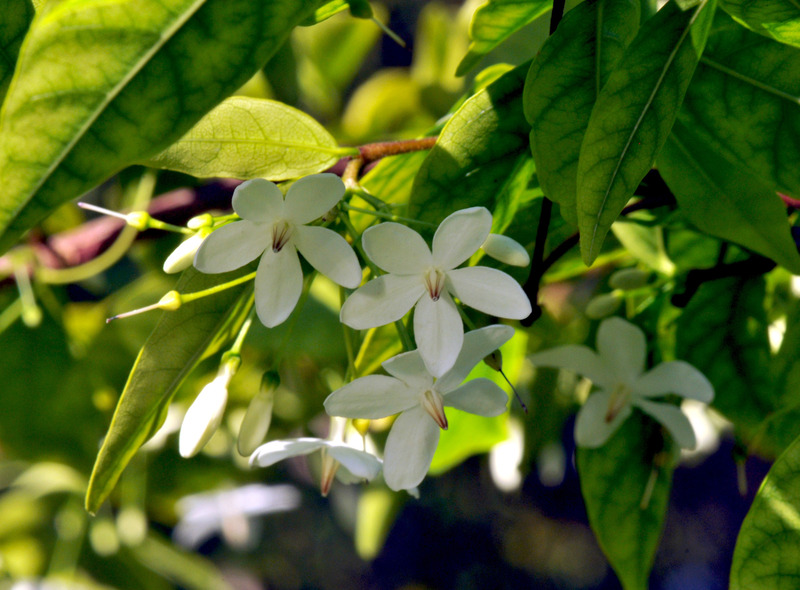 As I understand it the Water Jasmine is considered an auspicious plant that will bring happiness and peace to the person or household that is growing it. I’m not really sure how that belief came to be but I can only vouch for the fact that its scent is pretty soothing. It is also a pretty tough plant. It’s hard to kill once established. These little flowers will open for just a day. Love the delicate little flowers–would love to smell the fragrance. Happiness and peace is a nice association to have (and a big responsibility for the small blossoms). The fragrance is very light and delicate. Though it’s a tropical plant, you can grow it in your garden since you grow gardenia. Let it grow tall enough for you to be able to walk under it and look up at little white stars.